In the 40-odd years since the release and subsequent success of The Texas Chain Saw Massacre, we’ve lost count of how many Blu-ray and DVD incarnations have graced home video. You can never really have enough copies of Tobe Hooper’s genre-defining classic, though, can you? And sure enough, the folks over at Bloody Disgusting have spotted the latest steelbook edition, and it’s exclusive to Best Buy. It’ll set you back exactly $17.99, which isn’t all that bad when you consider that said package includes the 40th anniversary Blu-ray. Set for release on June 5th, this collector’s item features a pretty striking piece of artwork on the cover (see below), meaning Best Buy’s own version of The Texas Chain Saw Massacre Blu-ray ought to look nice when placed among the collection of any self-respecting horror enthusiast. But don’t just take our word for it – have a gander at the box art below and let us know your thoughts in the comments section. Unfortunately, the immediate future of the Texas Chainsaw Massacre series is less clear, after the franchise was quietly placed on ice following the release of Leatherface. That tells us that the next installment, if and when it arrives, will be angled as yet another reboot for the Sawyer Family. 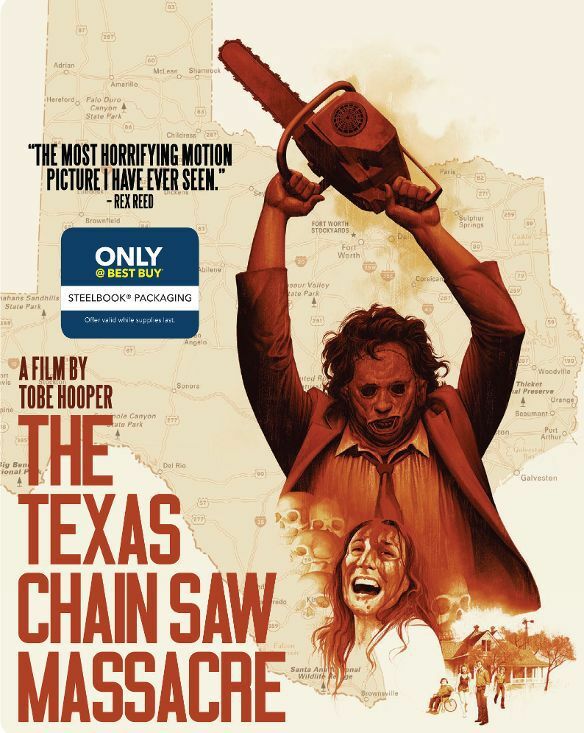 Priced at $17.99 and promising a true horror classic, Tobe Hooper’s Texas Chain Saw Massacre will enjoy yet another Blu-ray release on June 5th. As for what’s next…well, like we mentioned before, it’s looking increasingly likely that those in possession of the screen rights will double down on a fresh reboot – a clean, blood-free slate, if you will – rather than some form of continuation to Leatherface. Hey, we’ve seen sequels to prequels before!